This is the first viewing I’ve ever had of a zombie movie that came out of Ireland, and I must say, I was pleasantly surprised. “Boy Eats Girl” was clearly made in response to the success of 2004’s smash zom-com hit “Shaun of the Dead.” While this film obviously didn’t reach the same heights (in either exposure or quality), it does have some great high points and great takes on a lot of ideas that other zombie movies don’t pull off as effectively. The movie clocks in at a scant 80 minutes long, which is probably to it’s advantage, and really doesn’t use any “name” actors, at least none that audiences here in the U.S. will be familiar with (the “biggest” star in the movie is Samantha Mumba, who is borderline-memorable for her singing career and role in the 2002 remake of “The Time Machine,” a movie I very much enjoyed). Everything else I want to say about the film falls under a Score category, so let’s get right to it! The full review of this item, including the four-category G.O.R.E. 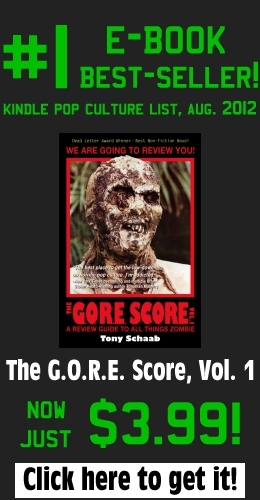 synopsis and Total Score, can be found in the book version of “The G.O.R.E. Score, Vol. 1,” along with over 50 other reviews! Click here to learn more about the book, or click here to view and order the book directly from Amazon.com!